In states like Colorado and Washington, where marijuana cultivation and sale are legal for recreational purposes, this new but growing industry may already comprise as much as 1% of electricity sales. Anecdotally, marijuana businesses can spend anywhere from a few thousand dollars to $100,000 per month in energy costs, on top of which they often must make significant investments to pay for utility upgrades to provide them with electric service. But high interest rates on financing, the abundance of regulation on other aspects of the business, and disconnects between business owners and the growers they employ can prevent investments in energy efficient equipment or renewable energy. Because marijuana cultivation and sale remains federally illegal, the solutions to these challenges will need to come from multiple players, including electric utilities, the public utility commissions that regulate them, state and local governments, and marijuana business associations. These entities can create new incentives and programs tailored toward the industry, offer alternative financing tools, structure smart electric rates, and promote research and best practices that fill gaps in industry knowledge around energy and renewables. 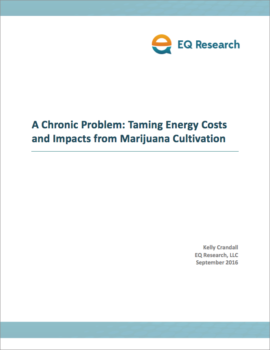 EQ Research’s white paper is designed to promote collaboration among these entities in support of more efficient, greener energy use in the marijuana industry. We’ve also provided a two-page infographic summary here, and you can read a blog post about the issue here.